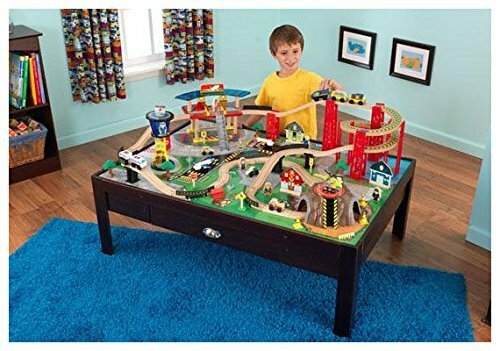 The best thing would be for a kid who loves trains would be nice train table that either comes with or without a train set. The idea here is that a train table can hold the train set just about the right angle of a good playing position. It also provides a good organization as it keeps all the train pieces on top of the table. That way, you can reduce the possibility of losing train pieces as your kids play. 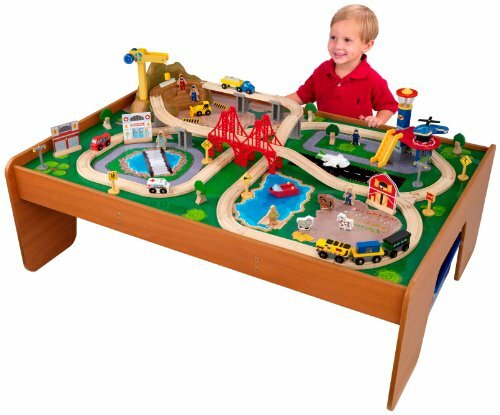 That is why we have decided to bring you a list of one of the best kind of table, the Kidkraft train table, so you can avail of only the best quality for your kid’s learning and play-time. 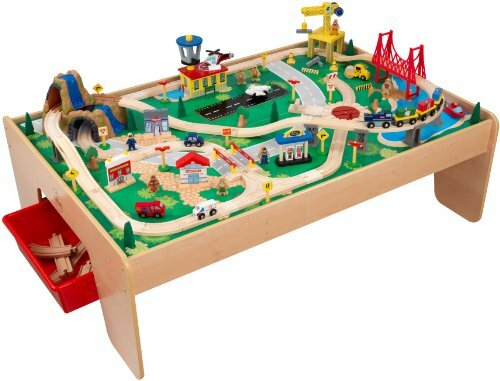 In addition, referring to the general purpose of the train table, it can also be used as an activity table. Children can use it to do their homework, crafts, artwork, play boards and other learning activities. 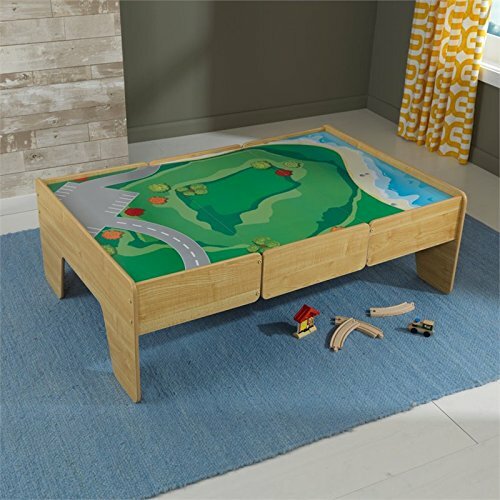 Some of these tables also include a built-in drawer and/or a large bin where they can easily place their materials and toys for a neat and organized play area. It also saves you the trouble of cleaning up a large mess after your kid’s are done playing. The benefits are just great for good learning, development and fun all together. Kidkcraft was founded and established in the early months of year 1968. It has been designing and creating different toys for kids for almost 50 years. They are also known to create furniture for organizing tools, books, play-sets and more. It can range from tables, drawers, bookshelves, chairs, dollhouses, so on and forth. The company is one of the few trusted brand when it comes to children’s learning and play. They promote learning and development for kids while at the same time, being able to enjoy the activity. This is Kidkraft’s Waterfall Mountain Train set. The set comes with a strong and sturdy table. It features a train set complete with figures, signs, tracks, bridges and a lot more. This set will save you the trouble of looking for train table and set individually. The table will keep all the train pieces on top and reduce the chances of a piece getting lost. It has elevated edges that protect the set from falling on the sides. The table and train set include a large bin for organizing. It features a short unboxing and review of the product and also some assembly guide. The next is features an espresso table that comes with a large train set, the Airport Express. The set includes a total of 100 pieces which is far more enjoyable that other train or play set. It provides many options for a kid’s role play. It is complete with tunnels, elevations, ridges, figures, train cars, plane, signs and more. The table also has a built-in drawer to keep important pieces of your train set. The drawer however, is small to keep all hundred pieces wherein a large bin is advised. What about a table with a nice lacquer finish? 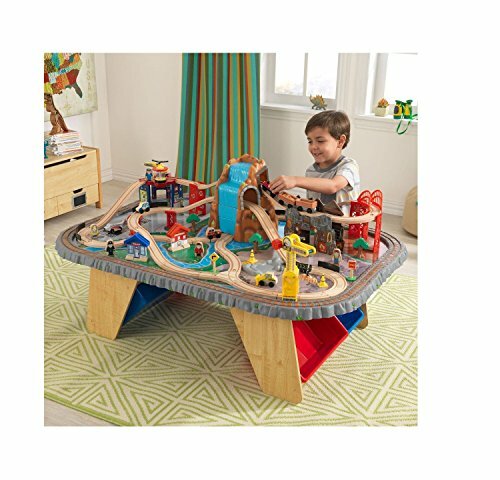 This is the Ride around Train Set and Table from KidKraft. 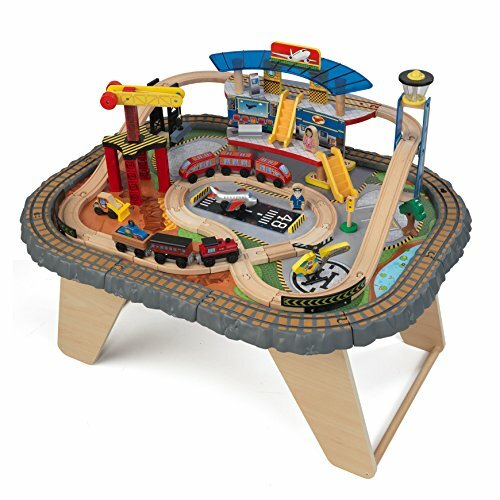 It features a simple table that comes with a train set at an affordable and reasonable price. The train set has a total of 100 pieces where airports, runways, boats, train cars, miniature figures, tracks, bridges and more are included. The table and set has a fairly large size where it can allow 3 to 4 children to play with it. It makes much more sense as it promotes social interaction and bonding. The next set is a 2-in-1 combo, activity and play table for kids. The table is smaller compared to the previous set but can still accommodate multiple children due to its fair size. It also includes 30 pieces of train set and some Lego compatible blocks. It comes with a double sided play board on top. The table has enough space underneath where you can place a large been for storage purposes and keeping things within arm’s reach. This is the Transportation Station Train Set from KidKraft. It has a total of 58 pieces where it can provide long hours of fun and entertainment. The set also comes with a train table, enough to cater the design of the train set. The size ranges from small to medium. The table however, may not be that efficient if used as a table for other sorts of activities due to its design. It has ridges and some areas are rough. But it is a strong and sturdy table that can accommodate several children playing and can withstand different play styles. Here is KidKraft’s Waterfall Junction Train Set and Table. The set is a combo that comes with a table and a ready-to-play set. It includes a total of 112 pieces that could bring about loads of fun and entertainment for kids. The table also comes with 4 large container bins where it can be placed to store all your train pieces in one place. The bins can be placed underneath, along the legs of the table in a slanted position. 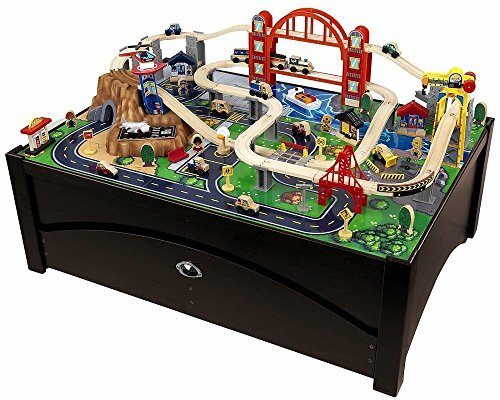 This table and train set can be availed for a great and reasonable price. This is the Metropolis Train Table and Set. This is one of KidKraft’s best-selling table and set. It features an espresso table with a large built-in drawer that uses a rolling trundle design. The set has about 100 pieces of colorful and durable train pieces. The table is made from solid wood construction that ensures and guarantees a long lasting, durable train table. It can sustain and withstand force, pressure from a harsh play style of a child. It is also wide enough that it can provide space and can be used by several children playing. Lastly, this KidKraft wooden play table is a simple table made from solid wood, with natural design. It has 2 drawers on both sides for storage. 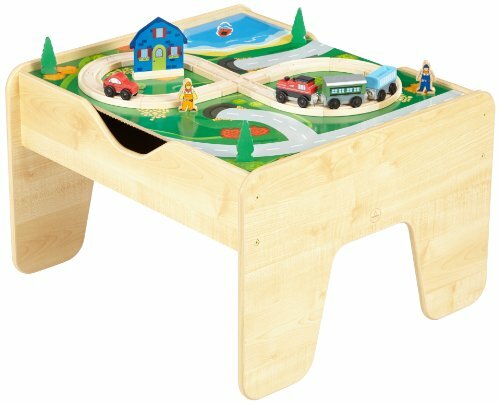 The wooden train table is ideally used for train tables as it comes with a built-in play board on top. The set however, does not come with a train set. This can be used for other recreational activities such as drawing, coloring, homework and more. It provides enough space for your children to move around and stretch. This is a comfortable table with durability that will last.